Applications are being accepted for membership in Phi Theta Kappa, the official honor society for community colleges. Phi Theta Kappa recognizes and rewards high-achieving students and provides opportunities through Honors in Action to develop such critical skills as problem solving, project planning, team building, effective communication and conflict resolution. These skills can give you a competitive edge when planning for transfer or applying for jobs. Eligible students are those who possess at least a 3.25 grade point average and have at least 12 college credit hours. The deadline to apply is Friday, Feb. 15. Visit Dr. Carolyn Smith, in room 303 in the Louisiana Building on the Mid City campus for an application or more information. 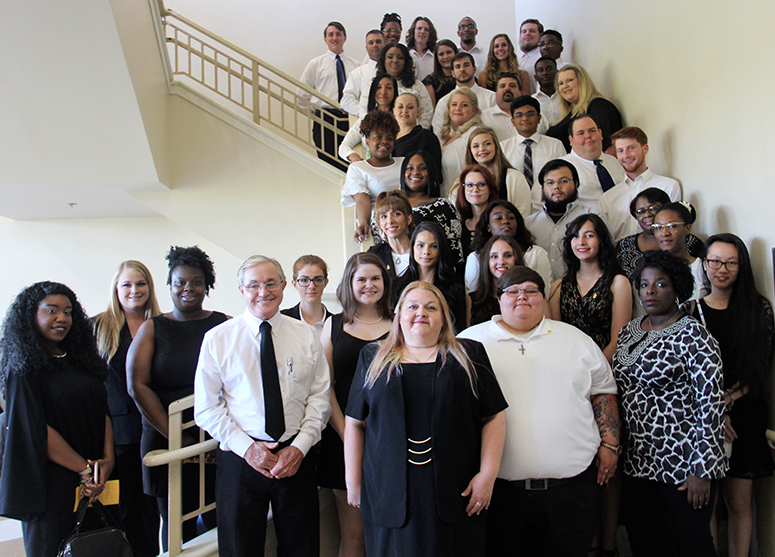 PHOTO: Spring 2018 inductees to the Beta Mu Omicron Chapter of Phi Theta Kappa International Honor Society of the Two Year College.